After Treebeard saves Merry and Pippin from Grishnákh, who had followed them when they fled into Fangorn Forest, they fall asleep while he talks. He sets then down in his home, Wellinghall. 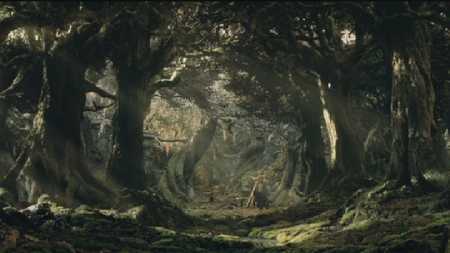 Pippin awakens first and Treebeard gives him some Ent draught from the nearby spring. When Merry awakens, Pippin won't give it to him, so they start arguing and struggling over the Ent draught. They trip over some nearby tree roots and the Waking Tree begins to pull them down deeper into its roots. Treebeard arrives just in time to order the tree to let them go. Editor's Note: This scene that was included the Special Extended Edition is a homage to a scene that is in The Fellowship of the Ring book where the hobbits are nearly drown by a weeping willow until Tom Bombadil comes along and saves them. The sequence with Tom Bombadil was skipped in the films because it does not contribute to the main plot.